Simple mehndi design for brides who like to keep it minimal! While heavy bridal mehndi designs are undoubtedly pretty, a simple mehndi design has its own grace. If you are a to-be-bride who wants to have a new mehndi design that’s simple and minimal, then scroll down for some major inspiration for simple mehndi designs! Henna designs that are as simple and graceful as this one are rare to find. If you love detailed wedding mehndi designs that are minimal too, then save this mehndi design image as an inspiration for your mehndi artist! If you are on the lookout for the latest mehndi designs for wedding, which are simple too, then this feet henna design is something you will absolutely love! Nothing beats the beauty of a simple mehndi design with minimal circular motifs on the palm. Perfect for the bride who’s traditional but wants to keep her mehndi design minimal. If I could show you what graceful looks like in a single picture, this mehndi design image would definitely top the list for wedding mehndi designs! The delicate floral design paired with dainty lace motifs is such a show stealer! Simple Indian mehndi motifs paired with a cute personalisation makes for this new mehndi design a sight to behold. This back hand mehndi design proves that minimal bridal mehndi designs can steal the show as much as heavy and intricate ones! If you just planning to wear mehndi on your big day as a mark of good luck, then a simple mehndi design like this one should seal the deal for you! This new mehndi design image has all my heart for its simplistic beauty and grace. The peacock and parrot motifs along with lotus make this new mehndi design a great option for brides who wish to wear a simple mehndi design for their wedding. If you swear by floral motifs and regard them as eternally beautiful, then this simple mehndi design replete with flowers is something that will definitely catch your fancy. A simple mehndi design up to the wrist with lotus motifs is a great idea if your style if minimal and graceful. Indian motifs with beautiful string patterns make this bridal feet mehndi the perfect option for someone who wants to keep it minimal yet beautiful. A glove-style lace detailed new mehndi design like this one is ideal for the bride who wishes to have a hatke mehndi design for her big day! This elegant mehndi design with a simple floral pattern is perfect for the bride who has an effortless and minimal style! A simple mehndi design like this one is perfect for brides to take inspiration for their roka or engagement ceremony too! The deep brown-back tint of the mehndi makes it pop out better than the orange-brown colour! This simple bridal mehndi with floral pattern up to the wrist is a great inspiration for minimal brides and bridesmaids alike. For brides who don’t want to paint their feet with henna up to the knees, this mehndi design image is definitely something you can take inspiration from. A simple circular mehndi surrounded by roses, leaves and beaded strings is one of the latest mehndi designs for feet that are trending this season. If you prefer simple henna designs, then this mehndi design image is something you can consider taking inspiration from! A simple band filled with Indian motifs across the feet is a fabulous mehndi design option for brides who want to keep their mehndi design lowkey but beautiful. This cute mehndi design with tribal figures, kalash motifs and cute little birds scattered all over make for a dainty and graceful wedding mehndi design for the modern bride! 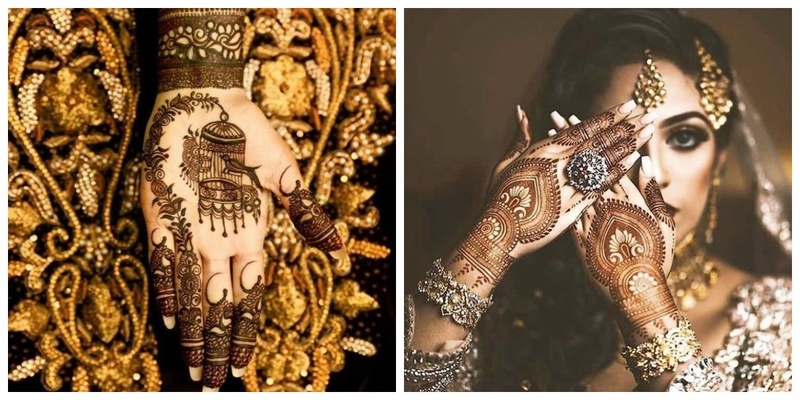 Did any of these simple mehndi designs inspire you save them for your big day?